Daily lifestyle show giving viewers the best in all things New York! Spring cleaning can feel completely overwhelming, but just think about the sigh of relief when it’s done. Lifestyle Expert and Founder of Joyfully-Me.com, Jeannine Morris, stopped by to showcase some of her favorite spring cleaning tips. When it comes to jewelry, I’ve seen everything from organized, beautiful wall wardrobes full of necklaces, bracelets and earrings to a cluttered mess of everything thrown onto dresser tops or into drawers. I recommend customizing your jewelry vanity with acrylic cases by Boxy Girl. 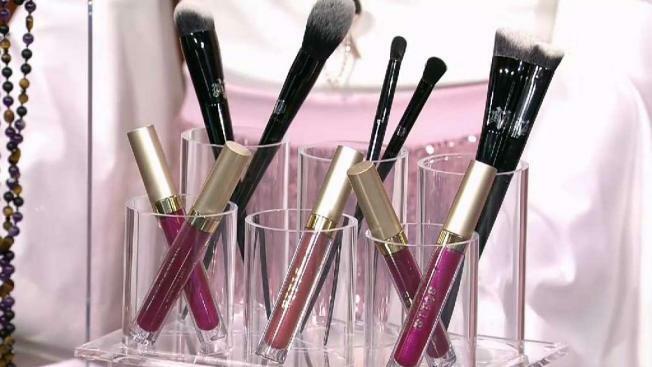 They make a slew of sizes and also have a collection for cosmetics, skincare and fragrances. When it comes to makeup, less is more, literally. Take the time to sit down and sort through your makeup bag. Get rid of anything expired and things you rarely use. Lilah b., a luxury color collection, has a declutter program that allows you to order a prepaid shipping label and send in your old cosmetics, empties and packaging so they can recycle it properly for you. Check out the program on their site. Order a clean out kit from Thred Up, fill the bag (that comes with a prepaid shipping label) with clothes, accessories, shoes and bags and the company will sell it all for you. For items that don’t sell, you have the option of getting them back (for a fee) or allowing Thred Up to recycle them on your behalf. It’s the easiest way to make space in your closet while making a bit of money. Think about how many germs are on the surface of your iPhone. Apparently, it harbors more germs than your toilet seat! Once per day, wipe down your iPhone, computer, remote control and any other electronic with rubbing alcohol. It’s a disinfectant and it dries very quickly. Always, always take your shoes off before you enter your home to keep it free of dirt and germs. Use an indoor and outdoor doormat to help. I love Josie B.’s door mats. You can customize them to say anything you want and they’re super cute.